Programmers often find it convenient to write numbers in hexadecimal (base-16) notation, particularly when performing bitwise operations. The reason is that it is easier for most people to convert binary to hex than it is to convert binary to decimal. If this doesn’t make any sense to you, don’t fret; if you don’t already know hex, chances are you won’t ever have to. You cannot use an exponent when using hexadecimal notation (nor with octal notation). Numeric data can take on several special values. When a numeric expression or variable exceeds the maximum representable positive value, it takes on the special value Infinity. Likewise, when an expression or variable becomes less than the lowest representable negative value, it takes on the value –Infinity. These values are sticky in the sense that when one is used in an expression with other normal values or itself, it causes the entire expression to evaluate to its value. For example, Infinity minus 100 is still Infinity; it does not become a representable number. All Infinity values compare equal to each other. Similarly, all –Infinity values compare equal. Although an easier way to get an Infinity value is to divide one by zero, the following code demonstrates what happens when you increment the maximum representable positive value. The other important special value is NaN, which means “not a number.” Numeric data takes on this value when it is the result of an undefined operation. Common examples of operations that result in NaN are dividing zero by zero, taking the sine of Infinity, and attempting to add Infinity to –Infinity. The NaN value is also sticky, but unlike the infinite values it never compares equal to anything. Because of this, you must use the isNaN() method or compare the value to itself to determine if a value is NaN. The isNaN() method returns a Boolean indicating whether the value is NaN. This method is so important that it is a property of the Global object, so it can be called directly in your scripts. Comparing the value to itself will indicate whether the value is NaN because it is the only value that does not compare equal to itself! Table 3-1 summarizes these special types. Not only is this not the expected result, but this value will not even compare equal to 1.6665! A basic rule of thumb is to never directly compare fractional values for equality, and to use rounding to convert numbers into a predetermined number of significant figures. The loss of precision inherent in floating-point arithmetic can be a very serious issue for applications that need to calculate precise values. As a result, it’s probably not a good idea to rely on floating-point arithmetic for important computations unless you have a firm understanding of the issues involved. The topic is far outside the scope of this book, but interested readers can find tutorials on floating-point arithmetic online, and more in-depth discussion in books on numerical analysis or mathematical programming. defines a string of length one. Strings are associated with a String object, which provides methods for manipulation and examination. For example, you can extract characters from strings using the charAt() method. This snippet sets strlen to 6. These are just a couple of the numerous methods available with strings that are fully discussed in Chapter 7. However, we do need to cover a few important string details now before moving on to other primitive types. var myString = "This is the first line. This is the second line." var myString = "This is the first line.\nThis is the second line." This example also illuminates an important feature of escape codes: They are interpreted correctly even when found flush with other characters ( . and T in this example). Latin-1 character represented by the octal digits OOO. The valid range is 000 to 377. Latin-1 character represented by the hexadecimal digits HH. The valid range is 00 to FF. Unicode character represented by the hexadecimal digits HHHH. More information about character sets and Web technologies can be found at http://www.unicode.org and http://www.w3.org. 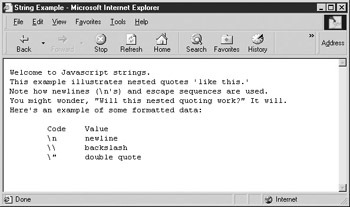 An example of the use of escape codes and quoting is found next. (X)HTML automatically “collapses” multiple whitespace characters down to one whitespace. So, for example, including multiple consecutive tabs in your HTML shows up as only one space character. In this example, the <<pre>> tag is used to tell the browser that the text is preformatted and that it should not collapse the whitespaces inside of it. Using <<pre>> allows the tabs in the example to be displayed correctly in the output. The result can be seen in Figure 3-1. <<!DOCTYPE html PUBLIC "-//W3C//DTD XHTML 1.0 Transitional//EN"
Booleans derive their name from George Boole, the 19th century logician who developed the true/false system of logic upon which digital circuits would later be based. With this in mind, it should come as no surprise that Booleans take on one of two values: true or false. increments x by 1 if the comparison x equal to y is true. Some Netscape browsers do not support this property so they will always display the second message (“Persistent cookies are not enabled”). This is because Boolean variables are assigned a default value of false if none is assigned. also results in the assignment of undefined to x. The null value indicates an empty value; it is essentially a placeholder that represents “nothing.” The distinction between undefined and null values is tricky. In short, undefined means the value hasn’t been set, whereas null means the value has been set to be empty. There is one further wrinkle to be aware of: the null value is defined as an empty object. Because of this, using the typeof operator on a variable holding null shows its type to be object. In comparison, the type of undefined data is undefined. results in a runtime error. The reason is that z is not merely undefined, it simply does not exist.